When a digital native brand makes the move from Instagram ads to TV ads, it’s a milestone of mainstream success. While they may already have had millions of followers and massive sales online, the move to more traditional media is a line in the sand between an up-and-comer and true success. 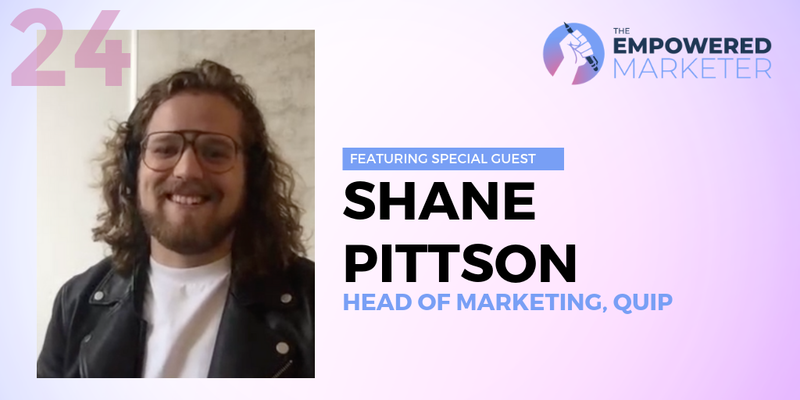 Shane Pittson is the Head of Marketing for quip, and recently led the digital native brand make the big leap to traditional media. You’ve probably heard of quip already: they make the sleek electric toothbrushes with a subscription. They’re an NYC-based brand looking to make the boring dental industry cool with better design, better customer experience, and even better marketing. But like many marketers, Shane didn’t major in marketing in college. He actually got into ecommerce via a creative Kickstarter back in 2013. He and a friend started a watch company called Schmutz and the entire experience was a crash course in ecommerce. From there, he joined quip and quickly helped build the brand that makes everyone think about tossing their toothbrush. 1. How do you narrow down the market since everybody brushes their teeth? Who’s the right target audience? There’s definitely an early adopter audience that really appreciated the design, and that was a lot of our early press. But since then, our customer base has evolved and it’s very diverse. For us, you’re totally right, everyone with a mouth we could potentially market to. There’s this really broad audience and the product and services have been designed from the start to be affordable, to be desirable, and to be simple and universal. That does present its own problems and its own approach to our strategy and paid marketing. We do tend to go broader. Any type of targeting generally has an additional cost in CPM, so we generally start with a really broad or low CPM opportunities. Then, as people show interest or engage with the brand or visit the website, we follow that traditional funnel approach and let that first act of interest really be the qualifier of who we should continue marketing to. 2. You mentioned that you’re going pretty broad, which may have contributed to the decision to do some TV ads. What was behind that decision to go to more traditional media? In part, it’s making sure we are hitting those that would be interested in different demographics. Everyone’s media consumption is a little bit different. For some, TV is still the primary method of media consumption, and because we are such a broad appeal product, we wanted to make sure that we were visible to every audience. We didn’t want to pigeonhole ourselves or give ourselves our own confirmation bias with those that were only consuming digital media. The TV ads have been really positive so far. We’ve seen some good results and some long tail effects from it, so it’s great. 3. You seem to really lean heavily on reviews and have a lot of reviews featured really prominently on the site. Why did you choose to do that, and how has that impacted your marketing? Word of mouth, pun intended, is really important. As a customer going through that purchase cycle decision, having seen the marketing and being a digitally native brand, I think it’s important for customers to be able to validate products. As you’re building brand awareness, if you’re reaching somebody that might not have a direct connection to someone that has used quip, I think reviews are a really strong way to show human experiences with the product. You can show why people appreciate certain value props, as opposed to just saying what the value props are. Another big positive aspect for it is within oral care, oral care products and their marketing is so known for, “9 out of 10 dentists approve of this message or this product.” I think that type of marketing has definitely evolved and for us, within our reviews page, we have verified dental professionals. They have a different icon so you can clearly see which reviews are from consumers and which reviews are from dental professionals. Not just a 9 out of 10 stamp, but actual reviews from professionals with their candid thoughts and opinions which many people are interested in reading. 4. Video is a really big part of your marketing strategy as well, outside of TV. How do you use video to educate your buyers in creative ways? For example, I saw an ad on Twitter showing the Quip toothbrush floating in space. Video is very important. It has been from the get-go. We started our marketing with paid social and it was a really great way to get that both qualitative and quantitative feedback, and really develop our messaging, and give that broad or holistic view of what quip is. A lot of times with a static image, sometimes our value props or certain things in isolation don’t tell the full story and can be easily misunderstood. Video has been really crucial for us to allow time to put everything in context. We try to make sure that that video is placed pretty high in the funnel and that it’s longer format. Then as people move down the funnel, video is still important and helpful, but a lot of times we shorten it and make it a little bit snappier. We focus in on maybe an additional value prop or something new, or user-generated content to see it more in action. But video has been a really important introduction to our brand, and the design, and the general ethos. We got our very own promo code from Quip! To learn more, go to www.getquip.com/empowered marketer to get a discount when you try Quip yourself.